weather | Ojo De Piedra – Eye of Stone. The cold refreshes the memories. The past few days were among the coldest of this autumn here at home, dark gray skies and rainy weather that barely let the sun shine through and the feeling that the hands will never be warm again. Yesterday while reviewing some images of my first course of trekking, climbing and mountaineering in 2007 I found this image of a place in the proximity of Nevado de Toluca, one of Mexico’s highest volcanoes. This area was about to be where our group would spend the night with no tents, just a vivac and yes, in a really cold environment, so much that I spent that night walking, watching the stars and taking a few photos. I processed the image like an infrared to emphasize the sensations of the cold that many of us experienced that night eight years ago. 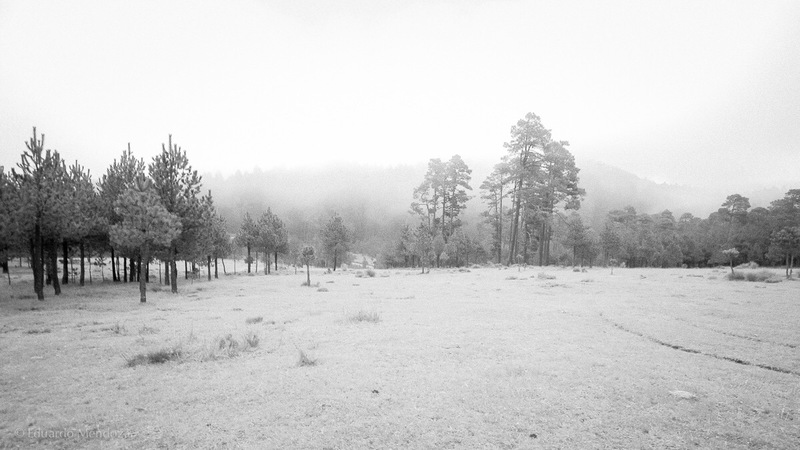 This entry was posted in Photography, Trekking and tagged Adventure, Autumn, Black&White, camping, Cold, hiking, infrared, Mexico, Nikon, trekking, vivac, weather on December 9, 2015 by Eduardo Mendoza.